I can never discuss these shows without thinking about the characters’ origins, so let me first say something about Captain America. 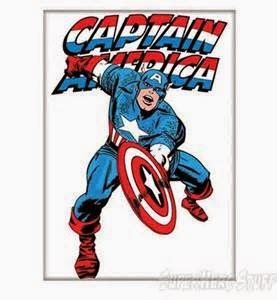 Captain America was created by the iconic team of Joe Simon and Jack Kirby. It made sense that a couple of Jewish cartoonists from New York would create a patriotic hero who was shown punching Hitler on the cover of the first issue. But I think they were mostly worried about earning a living, not creating a cultural icon who would, over 50 years later, be starring in a major motion picture. Nevertheless, the idea behind Captain America, the little guy who wanted to do his part and became the big hero for us all, still inspires writers and thrills readers and moviegoers all these decades later. To give a little more credit, Bucky was also created by Simon and Kirby. Nick Fury was created by Kirby and Stan Lee. The Black Widow was created by Lee, don Rico, and Don Heck. Finally, the Falcon was created by Lee with Gene Colan. If you don’t know comics, just let me tell you the above list of creators constitutes nothing more than a group of legends. The creators that brought us Captain America: the Winter Soldier were certainly standing on the shoulders of giants! As to the movie itself, it is simply fantastic! It is certainly one of my favorite super-hero movies, and I’m sure many others rank it this high, also. Part of this is the handling of the action and overall plot. Captain America works best when handling challenges that are just a little above those of the real world. CA:TWS does this extremely well, with Cap fighting mostly normal strength-level humans, with the exception of the Winter Soldiers himself. 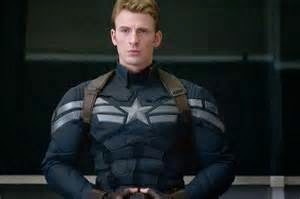 Unlike Thor, Iron Man, or Superman, the things Cap does are things you can almost see a real person being able to do, if he’s in really, really good shape! Likewise, the Black Widow and Falcon succeed in the same way as to be just human enough, yet pulling off the most remarkable things! The tech in the Marvel movies looks like the things we will experience here in the real world in 5 to 10 years. The other aspect of the film that makes it great is the characterization. The moral dilemma of how much power should belong to those who are the protectors is a good dilemma for Cap and Fury. Steve is able to hold onto his ideals despite the changing of times, and this shows us how well the writers understand the character. Cap isn’t perfect, but he’s always striving to do what is best. The Falcon is a perfect partner, for he is the modern version of Cap-another dedicated though haunted soldier. The Black Widow also has a great story arc, as she comes to face her troubled past and tries to move beyond it. I guess that sums up my thoughts pretty well. I’ll add just one thing: I really liked the guy who played Alexander Pierce. I’ll have to find the time to see if he’s done anything else of interest! The SPACE Anthology is a collection of comics from small-press/independent comic creators that I contribute to each year before the SPACE Convention in Columbus, Ohio. I’m going to take some time now to discuss the contributions in the 2014 SPACE Anthology. First up we have Jack Hammer: Hardboiled Hare, an anthropomorphic animal take on noir-style detective stories. The story by Tim Fuller is called “In Cold Milk” and it features our main character, a private detective rabbit, solving a case of a cereal killer. The strip is full of jokes about killing and cereal, and the art is very slick. I don’t want to give away all the jokes here, but they are quite funny. Next we have Faerie Tale by Brian John Mitchell. John tells the story of a trapped faerie in two pages with no concrete images. However, it’s easy to tell what is going on and I really like this different type of tale for a project like the SPACE Anthology. It breaks things up from the cartoony pages filling the rest of the book. Third we have Bruce Warden’s Turducken. This is a one-page gag about a Turducken (which is a word I’m surprised that MS Word recognizes) seeking therapy to understand the separate aspects of his being. This is another very good strip! Very nice idea! Next is an Incrediman adventure by Jared Catherine called “Incredimutt”. In this installment, Super-hero Incrediman deals with having his name being used to endorse all kinds of junk, including an incredibly lame Incredimutt cartoon. Then he fights Ninja Babies! This story isn’t as slick artistically as the previous strips, but the style works great for this story, which is clever in its extremism and ridiculousness. “Don’t Wake the Ape” by Jason Pauff is a strip about a Tarzan-type jungle warrior charged with bringing fruit to a sleeping ape. It’s simple but clever. This one may not seem like much for the first few pages, but the payoff at the end is worth it and I didn’t see it coming! “3 Days of Hell” by Lee Smith is next. The Ohio Chronicles creator tells a true story of race riots in Cincinnati in 1841. 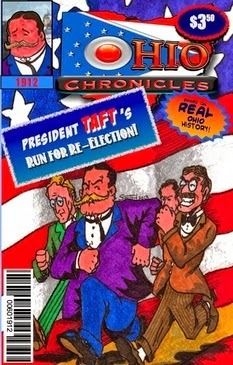 Smith’s comics are very nice educational tales of important Ohio history, and I enjoy reading them and have learned something new from each one I’ve read. “3 Days of Hell” is gripping in the way it recounts some dark history of battles between free black men and white mobs that included people in positions of authority. It’s an intense subject handled well. Michael Carroll then brings us a tale of his R.A.I.N.B.O.W. heroic group facing a bunch of really cool ninja. The heroes get their powers combined in weird and unfortunate ways. It’s really just an excuse to draw a bunch of cool things and make a bunch of jokes. Which is what Michael does best, and he delivers in this strip. The next strip in the book is my Mutant Elf story, “Training Day”, which flashes back to the days of Myzla’s Mutant Elf instruction. I wanted to tell a nice compact story that would give some insight into the Fairy World and what makes an elf a mutant! You can tell me if I did well. Last we have John Steventon anchoring the book with a tale of the Inquiring Minds. I love John’s stories and art, and this little tale of found Roman coins is cute. It’s a nice little tale to end the anthology for this year. Last week I attended the Small Press and Alternative Comics Exposition in Columbus as an artist. I have had a table at SPACE for many years, and I enjoy the con even more now than I used to. There’s something really neat about seeing the work of people working on their own projects, even if these projects have varying success. Some ideas just aren't too commercial, and some are not marketable for profit, but the SPACE is more about people putting their dream on paper (or the internet) than artists pulling in loads of cash. I picked up some new comics at SPACE, though I didn't make the rounds as much as I would have liked to. The traffic was pretty steady is light, but that’s usually true of SPACE, and I was rather engrossed in drawing and having fun conversations with those around me and folks who stopped by. Everyone was so very friendly and there’s a sense of camaraderie that abounds at SPACE that’s very nice. I thank everyone who bought or traded stuff, or just stopped to chat. I’ll have some comments and reviews of the stuff I picked up, as well as the SPACE anthology and this year’s OH, Comics anthology in the coming weeks. I have so much to say, and I really have to get around to typing more comments to post here. I spent the past week working like crazy on sculptures and such for the SPACE convention. I have so much to talk about here from that event, including remarks concerning the anthologies (OH, Comics and S.P.A.C.E. Anthology), my general views of the show, and reviews of the comics I picked up during the show. However, I’m going to start today by discussing the webcomic that premiered last week, Out After Dark. Out After Dark is an adaptation of an episode of the webseries Out With Dad that never got filmed. It is a “lost episode”. I covered some of my involvement last year shortly after starting the project. Now I can talk a bit about how I went about drawing the comic and why, as well as praise the writing and comment on the story. When I got the script for the episode-comic-to-be, I was amazed at the story. It’s a great piece of characterization and says some things about rose and her feelings about coming to terms with her sexuality, while at the same time showing us more about the relationship between Rose and Kenny. After marveling at the script, though, I had to figure out how to adapt in into a sequential art form. Because the story is just two people having a conversation, it could be told by having two heads talking to each other. But that would be pointless and boring. Instead I tried to find ways to make the conversation move with the characters as they walk down the street. There are some things that I could do in a comic that Jason could never do if filming (or at least not easily). 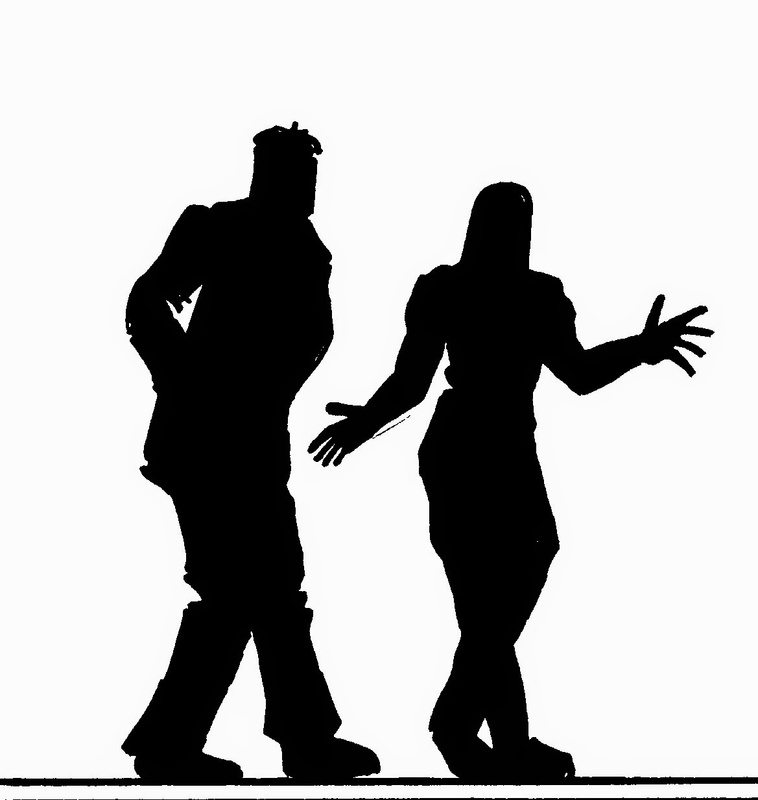 Including sudden shifts in camera angle and effects such as silhouettes and flashbacks and the floating heads effect. I also tried to establish a good page layout and pacing as the story progressed, then had the final page contain sparse dialogue to break the pacing for effect. At the same time, I didn’t want the art to be too radical, because I didn’t want it to detract from the story. Hopefully, some of these tricks were effective and enjoyable. It was a challenge to portray characters based on real people, and I thought it important to figure out “my” versions of the actors/characters so that I could make the story flow without too much worry over getting every miniscule detail about their appearances correct. Finally, I wanted to make sure I started the first page with a creator’s credit, since Jason is the source of all these characters and situations and creator credit is a big deal in comics. I could go on and on and babble some more, but I’ll leave it at this for now. I’ll be back around these here parts in a week or so. Stop by and have a look. I haven’t posted here in a couple of weeks, due to time constraints and not because I have nothing to say. So now is time to make up for lost time. 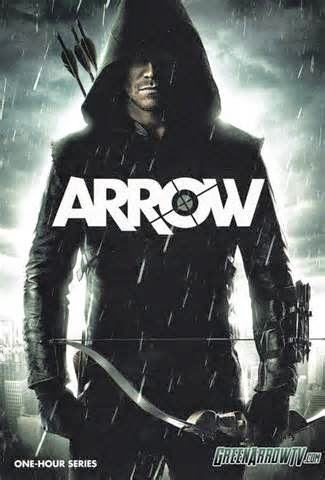 ﻿﻿﻿﻿﻿I just finished watching season one of the TV series Arrow, which is regularly on the CW network, though I watched it on DVD. I’ll admit my main interest in watching the series is that Marc Guggenheim is a producer/developer of the show (with Andrew Kriesberg and Greg Berlanti), and he’s been an “internet friend” of mine for some time , seeing as how we’re both bug comic book geeks. And I know, you’re thinking “a better friend wouldn’t have waited so long to watch his show”. I’m very busy is all I can say in my defense. Hopefully this review makes up for my tardiness. Arrow is an interpretation of the classic DC comics hero, Green Arrow. I’ll admit to not being a huge Green Arrow fan, mostly due to my being more of a “Marvel” person. The Green Arrow comic I most proudly own is a collection of Jack Kirby Green Arrow comics from the 1950s. 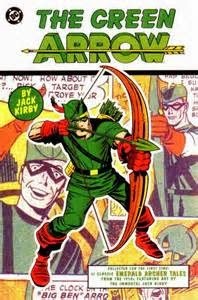 Kirby’s Green Arrow isn’t incredibly remarkable, except that it’s Kirby and therefore awesome and very much worth buying and reading, and that it includes a retelling of Green Arrow’s origin. I’ll summarize the origin: Green Arrow is rich guy Oliver Queen, who get marooned on an island and learns archery to keep himself alive. Eventually he is rescued and become a costumed hero in a fictional DC city. In the 50’s Green Arrow was just a Batman clone, really. He even had a teen sidekick (named Speedy for some reason), an arrow-car, and even an arrow-cave! Arrow does a far better job with the concept than the above 19050’s comics. Mega spoilers from this point on. Oliver Queen (Stephen Arnell) is the lone survivor of a shipwreck that killed his Father. He spent 5 years fighting all kinds of people on the island. And he returns to civilization to right his father’s wrongs and bring justice to his hometown of Starling City. The series switches from current events in Oliver’s mission to flashbacks about his survival on the island. The series treats Oliver’s actions as realistically as possible. He doesn’t have super-powers and the fighting sequences aren’t CGI. Granted, they are a bit over-the-top, but they seem very possible, if unlikely. For example, dodging machinegun fire while taking out bad guys with a bow seems very possible in the context of the show. Also part of the “realistic” approach is that the main character is never called “Green Arrow”; he’s “the vigilante” or “the hood”. But the best aspect of Arrow is the character and their interaction. Oliver wasn’t the best person before his time on the island, and he’s not the best at dealing with the people around him, including especially his own family, now that he’s back. Many of the character he interacts with are interpretations of or have some other nod to characters from DC Comics. The most important of these is Dinah Laurel Lance (Kate Cassidy), his ex-girlfriend based on long-time Green Arrow significant other Black Canary. I also like the inclusion of Roy Harper (Colton Haynes) as a kid form the poor side of town and the Huntress, though I’m not too big on her being so twisted. Having Oliver’s little sister (Willa Holland) be nicknamed Speedy is a nice touch, though I hope it doesn’t mean she’ll ever be fighting bad guys. Oliver’s partner, the bodyguard Diggle (David Ramsey), is an excellent non-comic character that helps because it gives Oliver someone to talk to in his hideout. A slight digression: For a while there, it seemed everyone was finding out Oliver’s secret though. But I think it all worked out in the end. Finally I must mention the best part of this show: Felicity Smoak! She is simply the BEST THING EVER!! I love her character and her portrayl by Emily Bett Rickards is just absolutely perfect!! Anyway, I’m totally hooked on this show and so is the rest of my family! I’m planning on when to watch season two. And see more of Felicity!! Oh…and everyone else too, of course.